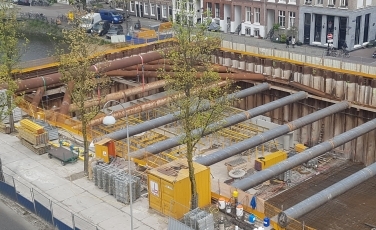 In 2014, Max Bögl Nederland B.V. was awarded the contract for an underground parking garage in Amsterdam Zuid (“de Pijp”), near the Rijksmuseum which will hold in total 600 places for cars and 60 bicycle places. This project is unique because it is the first parking garage built under a canal in the capital of Holland. It is mainly for residents who already have a permit. The main goal is to lower the parking pressure in the district and use the vacant space for other functions such as parks, bicycle storage and children playgrounds. In the beginning of 2016 the work started after preparations with the making of a cofferdam (size 260 x 30 m); driving sheet piles of 14 metres into the ground, placing a temporary construction frame (struts) under water and underwater excavation of 55.000 m3 of ground. In December of 2016, Max Bögl Nederland B.V. had a big operation of casting underwater (steel fiber) concrete, in a total of 4 nights and 5 days with an average of 10 concrete mixers an hour. After pumping all the water from the cofferdam, Max Bögl Nederland B.V. started by sealing the sheet pile interlocks, pouring concrete floors and placing prefab walls. Working with many subcontractors with little space and a tight schedule is very challenging. With the help of LEAN sessions Max Bögl Nederland B.V. could make the schedule more efficient and also get the commitment from subcontractors who need to do the job. Making the cofferdam waterproof was a challenge. Divers were hired to check all the sheetpiles and underwater concrete and carry out the underwater repairs. After pumping the cofferdam, the controlling of the groundwater around the cofferdam proved to be challenging. Max Bögl Nederland B.V. used return drainage to keep up the groundwater. Max Bögl Nederland B.V. had little space to carry out the works because the houses are nearby the project and there are rules for blocking the road. That makes the whole construction logistics very challenging. This issue was overcome by creating a construction road next to the project to efficiently do the logistics in combination with the two tower cranes. The project created lots of resistance from the local residents, which was very challenging. This was overcome by swift and open communication including a resident point of contact for the neighbourhood (24/7 accessibility). The project began in 2015 and will be finished in 2018.